The term "millet" comprises several genera of annual grasses that produce small seeds grown as cereal crops, although some millets are grown as forages rather than for grain production). (1, 2, 3). There are about 6,000 varieties of millet (3), categorized into several main types of millet (see taxonomy). Millet is a significant food staple of many parts of the world (see nutrition). Of all the millets, pearl millet produces the largest seeds and is the most common variety used for human consumption (4). 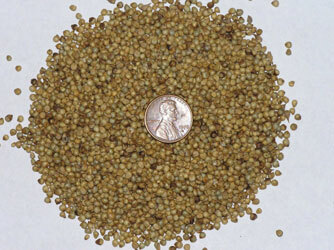 Pearl millet is a major crop in the semi-arid, low input dryland regions of Africa and southeast Asia (5). 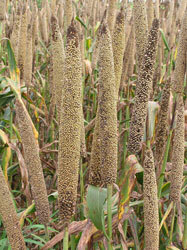 Millet is one of the oldest cultivated foods known to humans (2, 4). As with many cereals, the history of the grain is diverse and difficult to track, but it seems to have originated in China and Africa(3). Pearl millet probably originated from western tropical Africa more than 3000 years ago, and from there spread across Africa and South Asia(1), 2, (6). However, there is thought that it may have originated in the Abyssinia region (present-day Ethiopia)(6). Millet has been a staple in these areas since early times,(4), but was replaced by rice as the main staple in Southeast Asia and India (1, 2, 3, 4). Some records from China indicate that millet was grown as early as 4500 BCE, or possibly earlier, while other records indicate that several varieties arrived in China from Africa (1, 7, 8). Still others report it was grown by the lake dwellers of Switzerland during the Stone Age (4). Millet was introduced to the U.S. in 1875, but was not well accepted for human consumption (4). 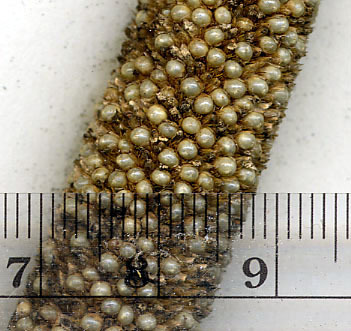 Like pearl millet, finger millet is thought to have originated in Africa and imported to Asia, where it assumed greater importance than it had in Africa (although still grown in Africa) (6). Pearl millet is grown and used for hay, pasture, silage, seed crops, food, building material, and fuel. (1, 9). Its popularity in Africa and the East is due to its hardiness in these climates. 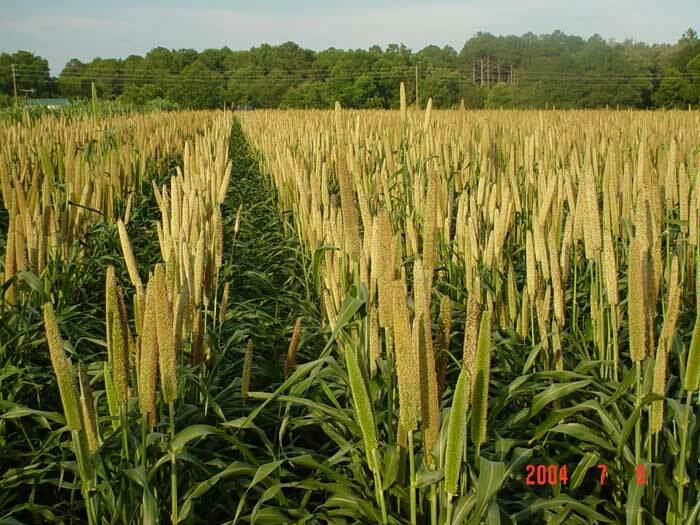 Pearl millet grows rapidly and is adapted for growing in most areas, including many harsh arid climates with poor acidic, high aluminum soils unsuitable for wheat, rice, maize, sorghum and barley. (1, 3, 4, 5, 6, 7, 9). It is hardy enough to withstand almost all environmental conditions and pests except for downy mildew (1)and standing floods. Today millet ranks as the sixth most important grain in the world (4, 7) For more information on millet production and where it is grown see "Maps and Statistics". For information on millet's global consumption see "Nutrition". See also Foxtail Millet. Syngenta Foundation for Sustainable Agriculture. Crops: Millet: What is Millet?